The National Park Service, BLM’s sister agency, has written to the bureau before the scheduled lease sales asking them not to lease parcels on the doorstep of Hovenweep National Monument. Less than three business days after the end of the partial government shutdown in January, BLM announced plans to auction off 156 oil and gas lease parcels in Utah on March 25 and 26, including those in the Four Corners region. Some of the proposed parcels are near Bears Ears, Hovenweep and Canyons of the Ancients national monuments. Ashley Soltysiak, director of Utah Sierra Club, says that the dialogue between BLM and environmental groups has been "severely lacking." "Few environmentally sensitive areas have been removed from the BLM's chopping block, despite our numerous calls for a review," Soltysiak wrote in an email. "Additionally, despite many attempts to contact the agency during the government shutdown, advocates were unable to obtain any clarity in regard to the upcoming March lease sale." The proposed leases threaten historical and cultural artifacts and will "fragment and destroy" some of Utah's most iconic landscapes, Soltysiak added. Ryan Sutherland, public affairs specialist at BLM Utah, says that the agency responds to all "substantive comments and protests" to the lease sale documents. Those responses are posted with the National Environmental Policy Act (NEPA) documents on BLM's ePlanning website. "As we work in support of American energy independence, we will continue to carefully consider all nominated parcels to determine if they are appropriate for leasing in conformance with the appropriate land-use plan and other environmental laws and regulations," Sutherland said in a statement. "The BLM Utah will continue to conduct the appropriate level of environmental review before offering any leases for potential oil and gas development." BLM just concluded the protest period for the March lease sale. Groups involved in the early comment period could protest leasing decisions to the Utah BLM state director, who has an obligation to respond to those protests. Over the past year, BLM has leased more than 112,000 acres in the Four Corners region, riddling one of the densest accumulations of cultural resources in the country with oil and gas leases, according to a Southern Utah Wilderness Alliance news release. Landon Newell, staff attorney for the Southern Utah Wilderness Alliance, says the bureau has "failed to analyze" the cumulative impacts of oil and gas leasing to the cultural and archaeological resources in the area during the two sales last year and for the upcoming sale. "The list is quite long of things that they've failed to consider, and that's a pretty significant omission not just because of the remarkable and unique nature of this area, but [because] it's also a very fragile ecosystem," Newell says. "Once destroyed, these cultural resources are gone forever. It's not something that we can bring back." The National Park Service, BLM's sister agency, has written to the bureau before the March 2018 and March 2019 lease sales asking them not to lease parcels on the doorstep of Hovenweep National Monument. BLM has not deferred any parcels in response to these concerns. When asked about why BLM decided to proceed with leasing parcels near Hovenweep National Monument despite receiving requests to defer sales after 2018 leases, Sutherland says the agency "carefully reviews each parcel, consults with tribes and cultural resource experts, and involves the public as part of our environmental review process and responsibilities under the National Historic Preservation Act." Every parcel leased includes a Cultural Resource Protection and Threatened and Endangered Species Act Stipulation, Sutherland says. The stipulations authorize BLM to modify and disapprove development proposals that could result in impacts to cultural resources that cannot be successfully avoided, minimized or mitigated. Following leasing, BLM conducts additional environmental reviews of proposals for exploration and development and must approve them before ground disturbing activities can occur. "This means that the BLM has the authority to protect, mitigate, or move them off the lease if determined that we cannot protect the resources," Sutherland says. "Strong stipulations like this give us confidence that we can protect the cultural resources entrusted under our care." According to Sutherland, in regards to leasing near Hovenweep National Monument, BLM has the responsibility to analyze proposed lease parcels identified as available for leasing under the applicable resource management plans. "As part of this process, the BLM has worked closely with the National Park Service during previous sales, and will continue to coordinate with them, as well as other agency partners and stakeholders, regarding potential impacts of leasing," Sutherland notes. In response to BLM's notice of the March 2019 sale, the All Pueblo Council of Governors and Pueblo of Acoma have requested that BLM defer selling leases in the area until the agency conducts a thorough cultural resources review of the region, according to SUWA. The Hopi Tribe has previously called for the same review. BLM has not deferred any parcels in response to these concerns. BLM also plans to lease nearly 100 parcels in eastern Utah's Uinta Basin and Book Cliffs region, which the Environmental Protection Agency recently designated in "nonattainment" of national air quality standards for ozone. The Uinta Basin already suffers from some of the worst air quality in the nation. Sutherland says the act of leasing would not result in direct impacts to air quality. "Lease stipulations and notices are applied to leases when they are issued to notify the operator of what they would be required to do and what they could potentially be required to do at the Applications for Permit to Drill [ADP] stage," he explains. "This allows the potential lessee at the time of bidding on the parcel what the range of requirements they can expect when they exercise their lease rights." All federal actions on BLM managed lands must comply with General Conformity Rules under the Clean Air Act to demonstrate that federal actions conform to state or federal implementation plans to clean the air, Sutherland says. Sutherland points out neither the Environmental Protection Agency nor the Utah Department of Environmental Quality—the regulatory authorities responsible for compliance with the Clean Air Act—objected to the proposed lease terms nor requested that additional mitigation measures be added. The Beehive State has a surplus of BLM-managed lands that are under lease but not in development, with only 45 percent of its total leased lands in production. Approximately 2.5 million acres of federal public land in Utah were leased for oil and gas development at the close of BLM's 2017 fiscal year—the last year in which BLM has provided statistics. At the same time, oil and gas companies had less than 1.2 million acres of those leased lands in production. Newell says those figures show "there is absolutely no need to rush forward with more gas and oil leasing." "There's no demand for it, and all it really does is promotes speculation where these small operators come in and they acquire leads which lock up public land for at least 10-year periods for their minimum prices, [for] $2 an acre or less," Newell says. "Once these lands are leased, it keeps the door open for development, and that's really the big risk." The number of acres leased for oil and gas development has decreased substantially from the highs seen in the 1980s. Currently, there are approximately 2.3 million acres leased in Utah, compared to 4.7 million in 2008, and the high of 19.7 million acres under lease in 1984. The oil and gas industry on public lands in Utah contributed $2.6 billion in total economic output in the fiscal year 2017. "However, not all lands that are leased on federal lands become developed," Sutherland says. "Leasing enables companies to secure rights to mineral resources before investing in geophysical testing and other kinds of exploratory techniques to determine first, if resources are present, and second, if development is economically feasible." In San Juan County, home of the proposed leases for March 2019, "nearly nothing" is happening on the development front, Newell says. "In the last five years, there have been less than seven wells drilled in all of San Juan County. It's not an area that's on any serious oil and gas operator's radar, so there is no return for selling off public lands at rock bottom prices." The Trump administration's claim that it could create jobs in these areas and San Juan County promoting fossil fuel development "really has nothing to do with reality, it's more based in politics and animosity toward conservation and land protection," Newell says. Once the lease is issued, BLM does not have a legal authority to prohibit development on that lease, Newell notes. The agency can only make minor modifications to the proposed development. "There's a hope among certain state leaders and federal representatives that the next energy boom is coming to this part of Utah. That's really not the case," he says. 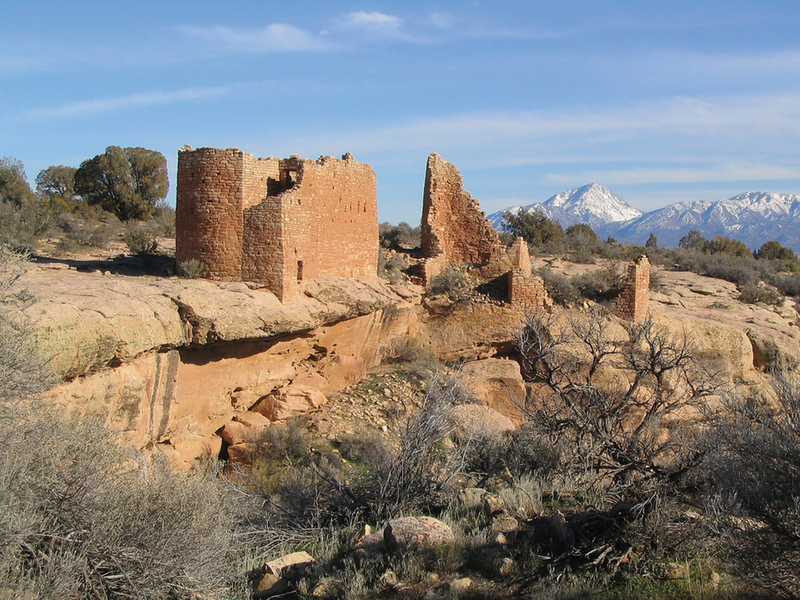 In early February, Advocates for the West filed a lawsuit in Federal District Court for the Southern Region of Utah on behalf of Friends of Cedar Mesa, an environmental organization based in Bluff, saying that the proposed oil and gas leases pose a threat to tens of thousands of archaeological sites in the region. The lawsuit challenges the oil and gas lease sales that occurred in March 2018. The areas in dispute are located between Canyons of the Ancients National Monument in Colorado and the former boundaries of the Bears Ears National Monument in Utah. Soltysiak says if the Trump administration continues the same energy dominance policy across the West, the long-term consequences are going to be "grave." "They will translate to a loss of many of Utah's and America's most prized national treasures, threatening our National Monuments, National Parks, tribal sovereignty, and the health of our communities and economies," Soltysiak finalizes. "The agency has been extremely lax in allowing for bids in critically sensitive areas, areas whose intrinsic value and cultural resources may soon be lost forever."